Although Holmbush Tower, being placed some two miles west of Pease Pottage, was located outside the area covered by this website I have included it as it would have been a major landmark known to everyone in the village before being demolished sometime in the early part of the last century. 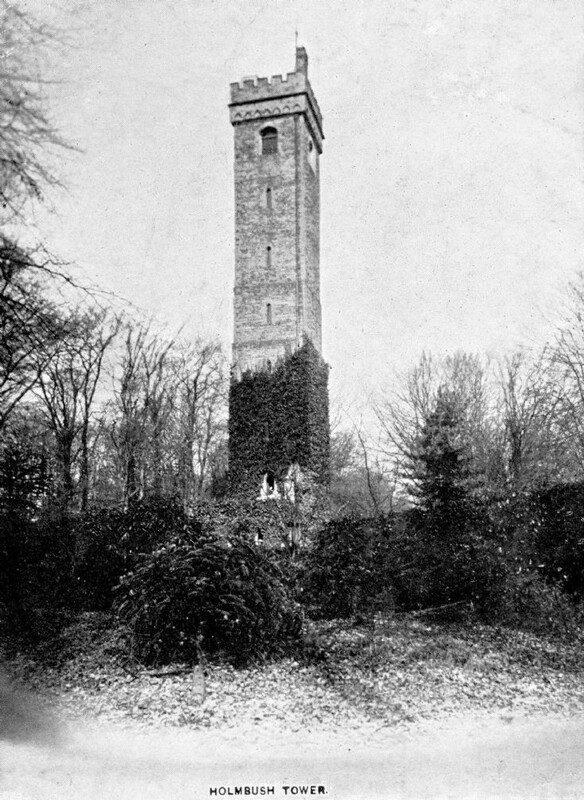 The prospect tower was designed by a London architect, Francis Edwards for T. Broadwood, Esq.of Buchan Hill. It was located just a few yards to the east of Tower Road which runs from opposite the Dragon Inn at Colgate towards Faygate. The tower was about 380 yards from the pub. The builder was Mr Summer who was assisted by his son and another man, Mr Cox. The stone was dug on the Holmbush estate and prepared during the winter months. Mr Summer laid every stone in the building himself over the summer months from 1855 to 1857. The tower was 106 feet high and, it was reported usefully, as being 500 feet above London Bridge! “There was a delightful walk from Slaugham over fields to Holmbush, where we enjoyed climbing the tower; alas, now pulled down. The way was across the field at the bottom of the village, over the road at the top of the common, by Ashfold, Carterslodge, Tattleton’s Farm, over the head of the Hammer Pond, and away out at the top of Colgate Street. We spent many a picnic in the woods opposite the tower and always climbed the tower from which a splendid panorama could be viewed. The large Version shows a close up of the top. My aunt, Mrs Mabel Field (née Tester), wrote on 2nd August 1943 that for a small payment you could climb the tower, which was over 100 feet high, and look out over the forests to the Sussex Weald and the South Downs. "Sometimes during the summer my Mum used to take us on the bus to Colgate. We got out at the end of a pretty quiet road, all rhododendrons on either side and then we got to the tower and a lady with a glass eye was in charge. She scared me. I guess she lived in rooms at the bottom. I forget what the charge was to climb the steps to the top of the tower."